Well, hello there! 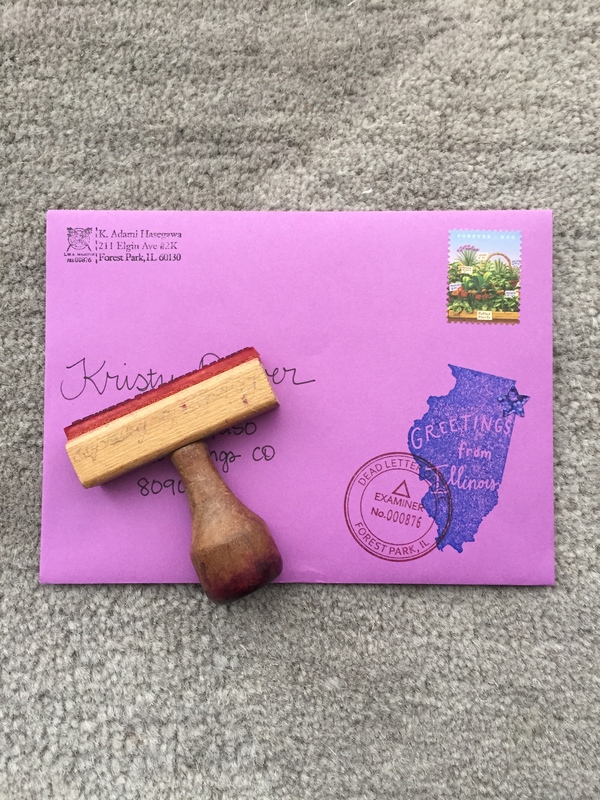 It’s been a little quiet around here, but I wanted to pop back in because it’s that time of year again–Letter Month! 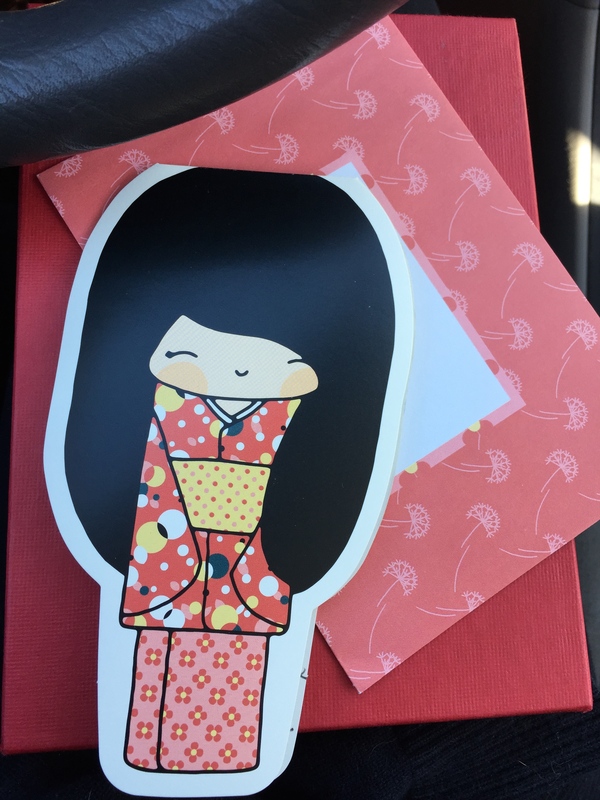 I’ve been a dreadful pen pal since I got home from Japan last spring (yes, that long ago) so I’m hoping this will get me back in the mail spirit again. P.S. If you need cards for letter month, the shop is open. I tried to take a picture of my hand “feeding a mailbox” each day so please enjoy some of my favorite shots from the month. 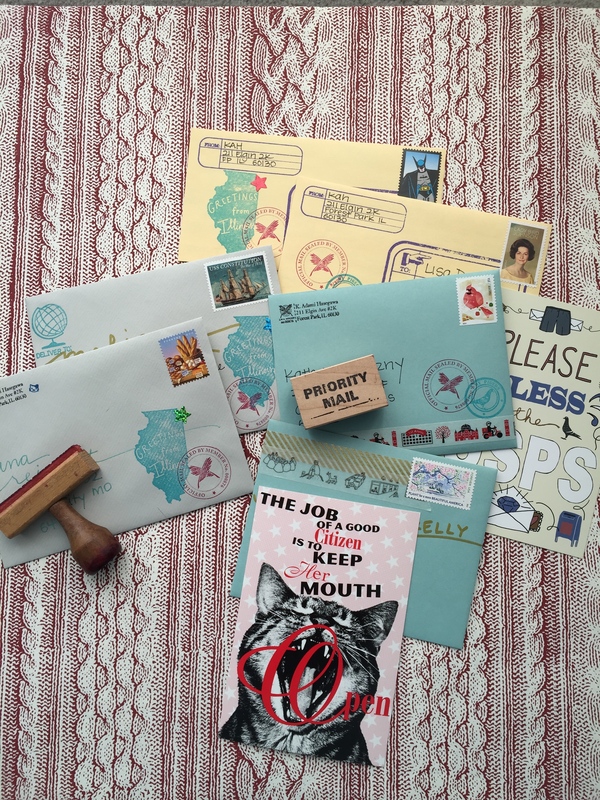 I sent a few packages this month and it’s been fun to play with stamp combinations and mail art on tiny boxes. I am all caught up on my mail pile! I enjoyed clicking on the #lettermo hashtag on Instagram to see what other people were doing throughout the month. A package I sent to Danielle weighed 12.9 ounces, a mere 0.1 ounce under the 13 ounce weight limit for mailing a package from a blue box. It was a mail miracle! Aaaaaaand off to mail my first card for March. I only made a few Valentines this year. (I got behind in planning as usual.) I made a few Elvis Presley Valentines and a few MY Presley Valentines. For the Elvis ones, I started with my usual heart cards and stamped them with some hearts. Then I used my vintage DYMO label maker for the words “Don’t be cruel.” I added an Elvis sticker. (Ah, that gold lamé suit is fantastic, right?) On the back, I wrote “Be mine.” (Get it? Don’t be cruel, be mine?) Easy and kind of cheesy…perfect. For my Presley-the-cat fan friends, I made cards using A2 cards and some pictures of Presley hanging out with Yeti holding our special Presley patch. I added “Presley loves you” with my DYMO on some and “P *heart* Y” with Thickers on others. They were fun to make and, even though some will be late, I suppose a little message of love is well received all month long, right? Are your pens and piles of stationery all ready for another Month of Letters? I have my first two letters ready to go to the neighborhood blue box this morning and a pile of letters that need replies. 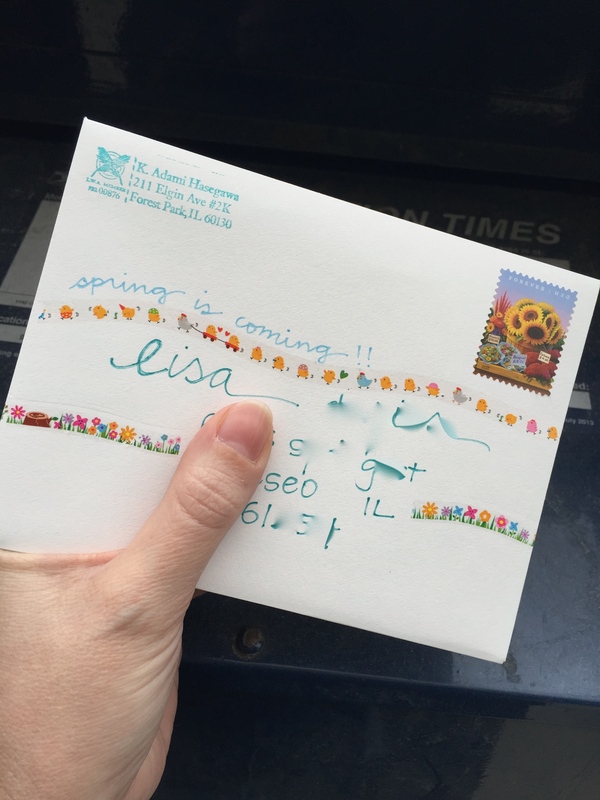 Last year, I had a pile of goals set along with Letter Month, but this year, I just want to keep it simple: mail something every day and try to mail it from a neighborhood blue box (instead of being a lazy hermit and mailing from my building’s box.) I’m also going to try to start my day with letter writing to see if I can start a new habit around here. I’ll let you know how it goes. I’ll be sharing my daily outgoing mail on Instagram for now. Are you participating? Do you have specific goals in mind? How is January almost over? Before we move too far into 2016, and before we get into Letter Month, I wanted to share my mail totals for 2015. Last year was the first year I’ve kept track of what I sent and how much I spent on postage. Each day I write on my daily calendar page what I sent out and how much the postage cost. 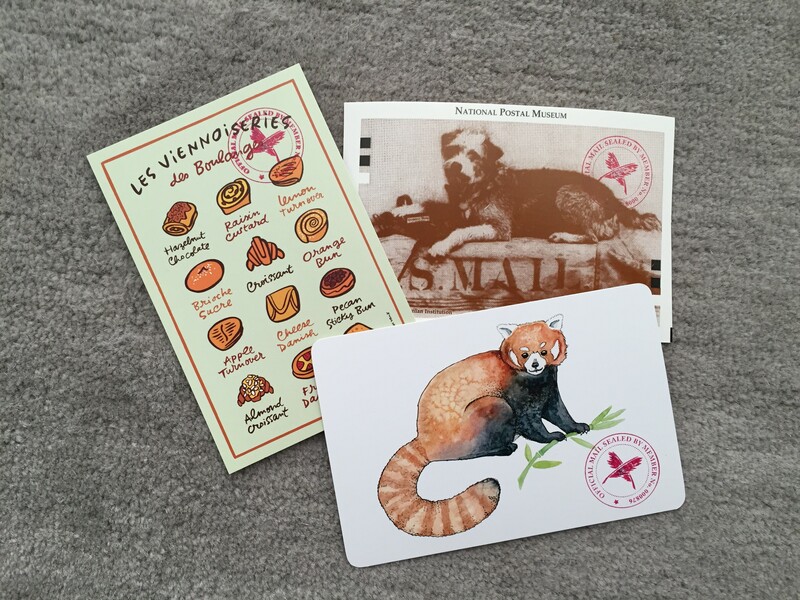 On this particular day, I sent out three letters, four international postcards (for a postcard swap I participated in), and one U.S. postcard. 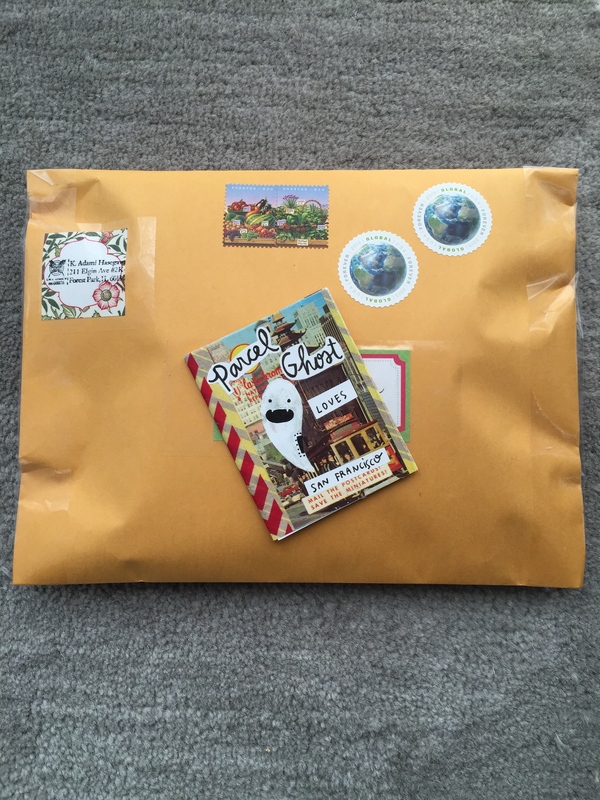 Throughout the month, I tally up the total number of U.S. letters, international mail (letters and postcards cost the same, so I lumped them into the same category), U.S. postcards, and packages I sent that month. Then, at the end of the month, I total up the number of pieces sent and the cost for the month and write it on the monthly page of my calendar. Not too shabby, right? My best month was December (no surprise) with fifty-six, but February wasn’t far behind with fifty-one. And September was the worst with a piddly FIVE pieces of mail leaving my mailbox. Womp, womp! This week, I’m trying to respond to all of the mail I’ve received since the start of 2016 (some is pictured at the top) so I can start Letter Month on a clean slate. Wish me luck! How’s your mailbox so far this year? *This total does not include the cost of postage of mail sent from Japan. It felt weird not to write a letter on Sunday and not to have anything to mail on Monday. 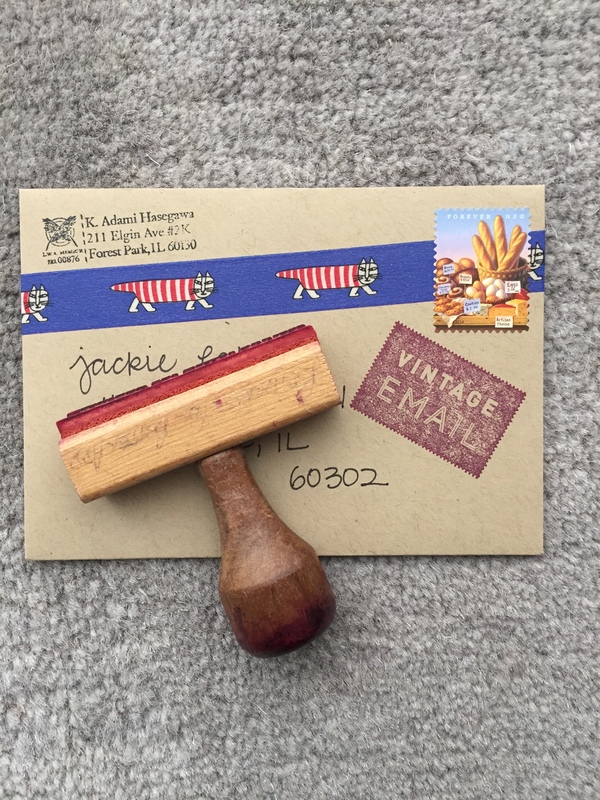 On Saturday when I checked my mailbox, I only found junk mail, so my inbox is officially empty, my letter ledger is turned to a fresh new page and my stationery is all organized and ready for action. I’m not feeling the same burn-out I’ve felt after previous Letter Month attempts. I’m not exactly sure why. 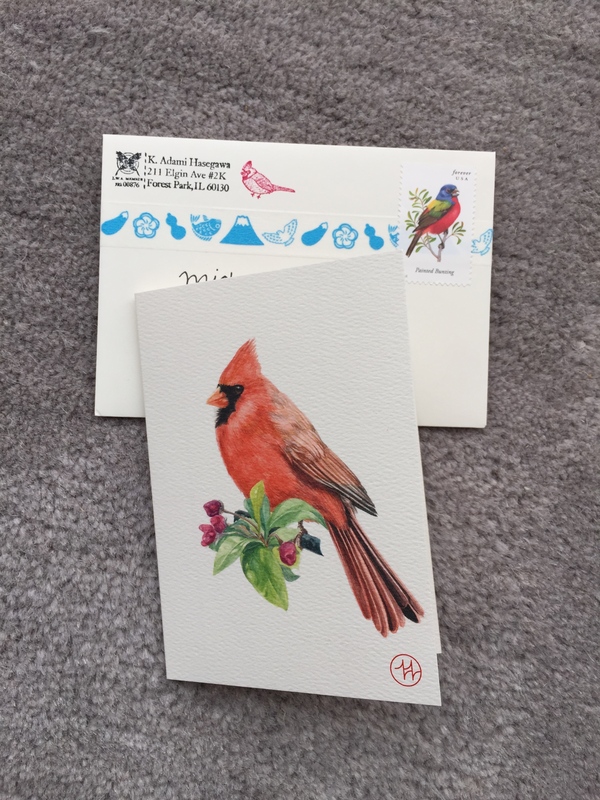 Maybe because I sent more postcards than usual, maybe because I didn’t write much in January, maybe because it’s been snowy and cold and letter writing is the perfect indoor activity and a much-needed break from technology. Whatever reason, it feels good to be done but it feels sad to have an empty mailbox. 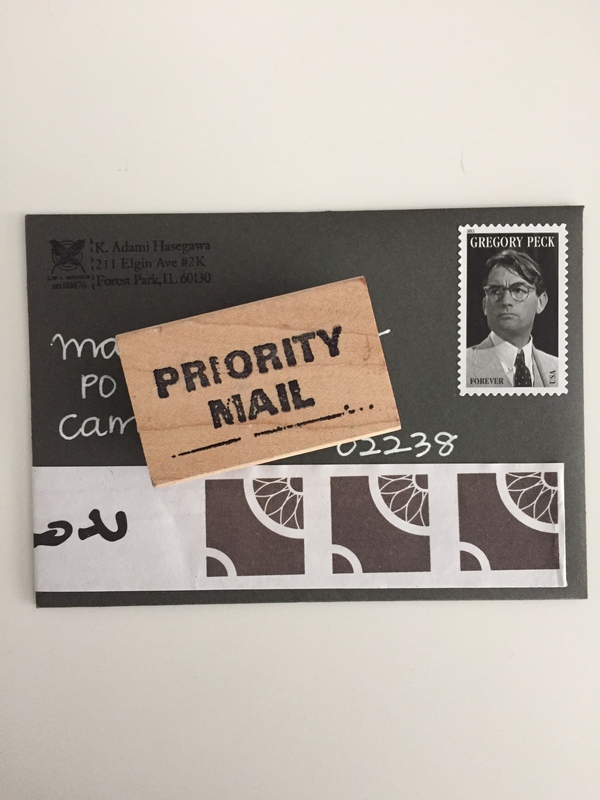 I hope I can continue responding in a timely manner–it feels good to have a nice flow of new mail on my desk instead of the same letters languishing for weeks. I also visited seven blue boxes, which doesn’t sound like a lot, but it’s six more than I normally visit. Mostly, I drop my letters into our lobby box or into the blue box near work. I visited six other mailboxes, and four of those were mailboxes I’d never used before. 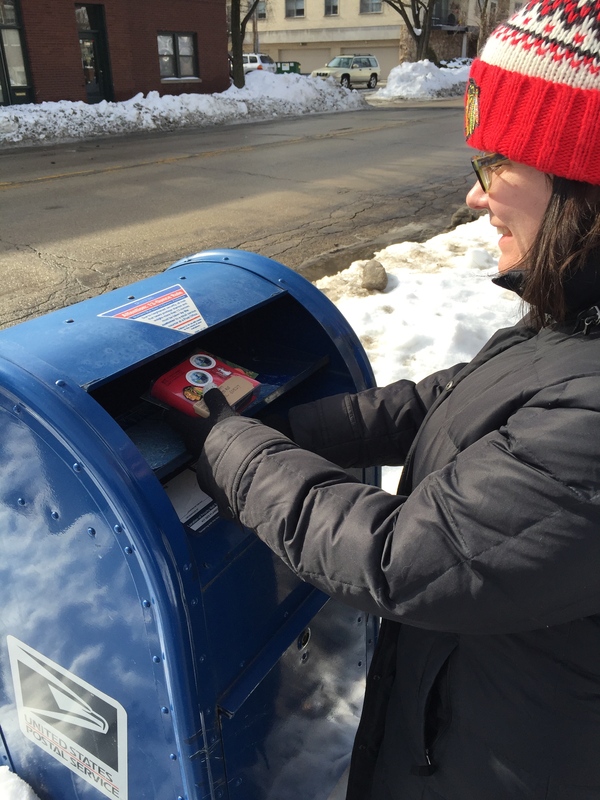 Now that spring is on the horizon, I hope I’ll get out more to mail from some more blue boxes around Forest Park. 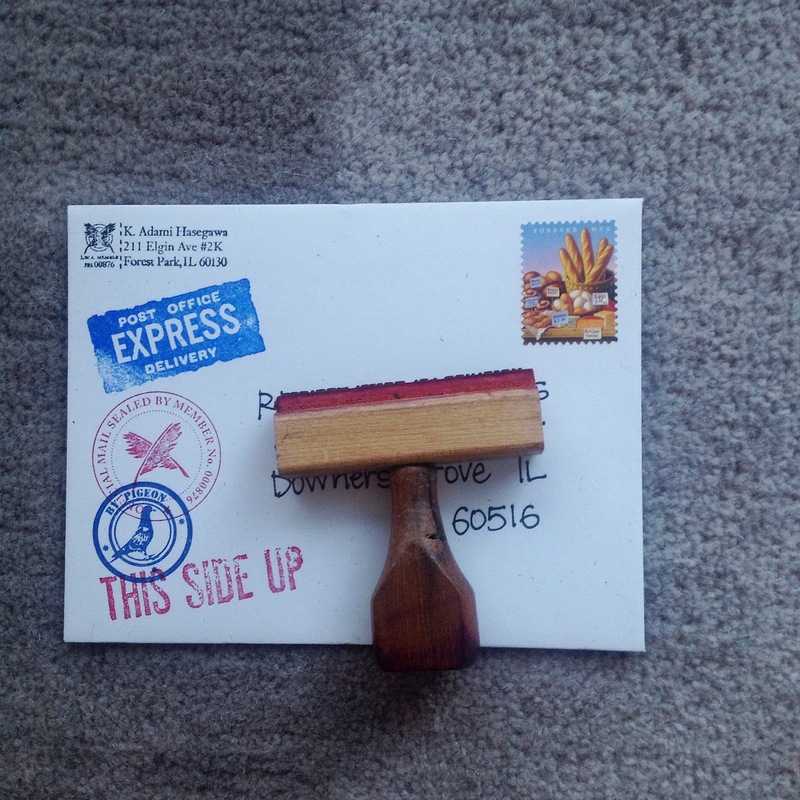 I’m also making up a rubber stamp that says FEED YOUR MAILBOX as a good reminder to frequent those blue boxes. How did your Letter Month go? Did you achieve your personal goals? Letter Month is OVER! Week four started out pretty weak, but I finished strong–replying to every letter I’ve received during the month (and some lingering in my inbox from January!) I relied on my lobby box, but also visited the mailbox by work, the River Forest snorkel box, a new-to-me box by Penny’s Noodles in Oak Park and one in Chicago’s Wicker Park on a ramen date with Donovan. She and I walked for blocks looking for a mailbox…it’s nice to hang out with someone who is willing to hunt for a blue box with me. It feels good to finish strong and not burnt out…but more on that later this week! Out of the blue one day, long, long ago, I received a package from my online friend Holly. 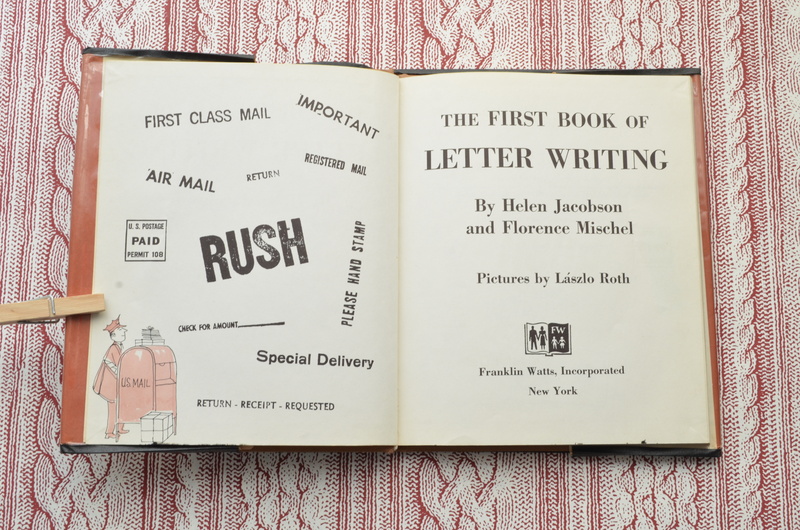 Inside was this fantastic children’s book, The First Book of Letter Writing by Helen Jacobson & Florence Mischel. The delightful illustrations were done by Lászlo Roth. 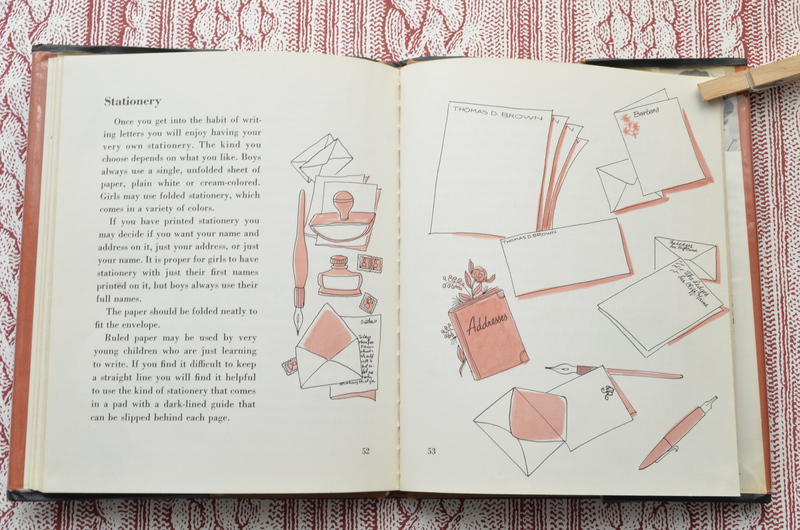 Published in 1957, it covers everything the mid-century child needed to know about letter writing: how to write a letter, how to address the envelope, proper penmanship, writing celebrities, thank you notes, condolence notes, stationery, postage and more. 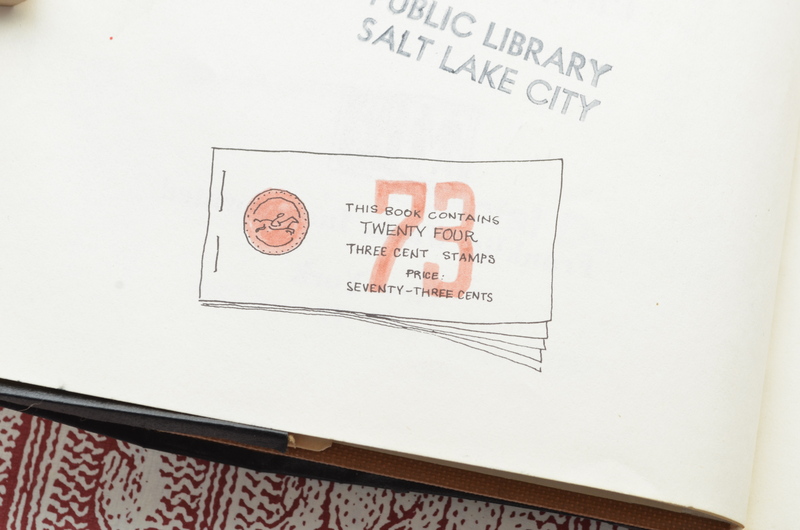 The book originally came with a book of stamps to get the letter writing started! Just like yesterday’s book, some of the book reads as a time capsule of children’s correspondence in the fifties. 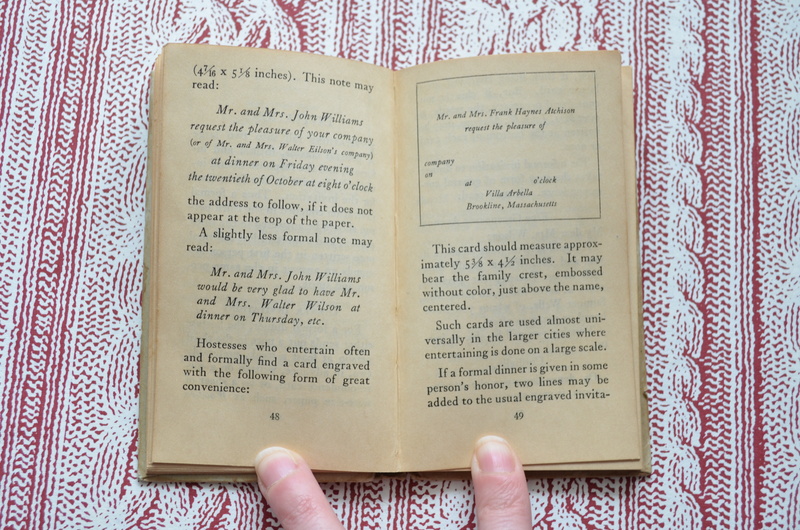 I didn’t realize there were rules for children’s stationery: “boys always use a single, unfolded sheet of paper” while “girls may use folded stationery.” But most of the book is still helpful in its teachings of letter structure and helping children to learn that their letters should be a mix of news and questions for the recipient. 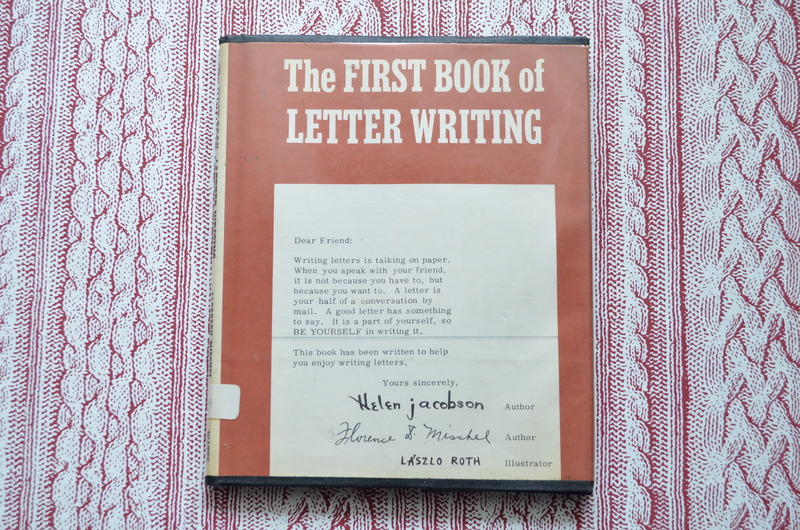 I think it would still be a great introduction to letter writing. Receiving this book–which is a technically a “destroyed” library book–made me both happy and sad. Of course I am thrilled that Holly found it and thought of me and sent it my way. I will treasure it forever. 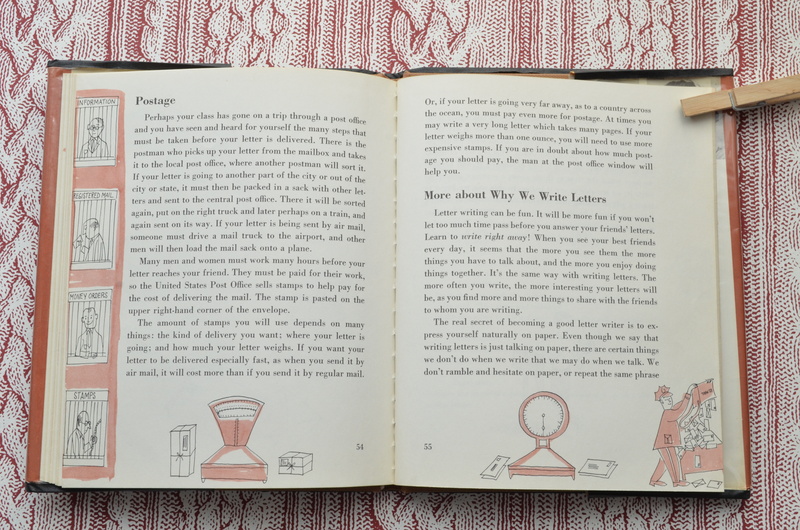 But I’m sad because this book about letter writing isn’t out there in a library for a child to discover. Maybe checking out a book like this would inspire a new generation of letter writers. In my personal book collection, it has a very limited reach…how sad! But thankfully it was rescued from the dumpster, right?! I just requested a bunch of letter writing books from the library, so hopefully in the coming weeks, I’ll have more books to share. It will be nice to keep the spirit of Letter Month going a little longer, right? 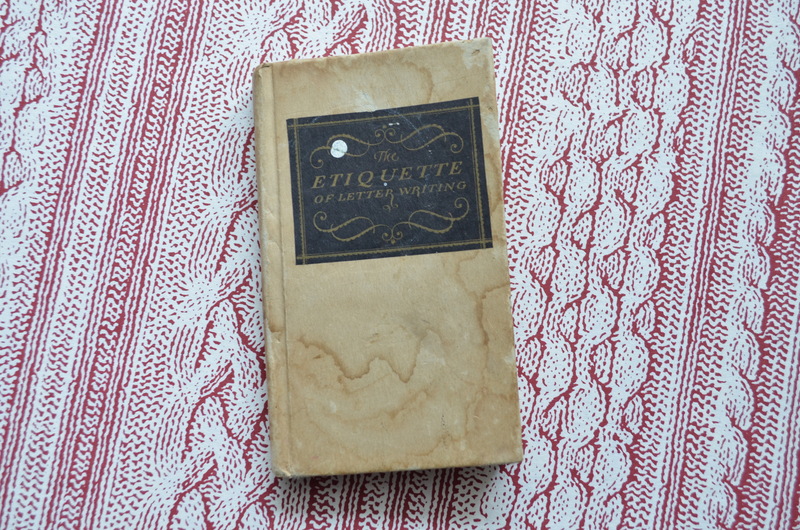 My friend Peggy gave me this tiny book, (A Desk Book on) The Etiquette of Letter Writing, last summer. It was published by Eaton, Crane & Pike Company in 1927. 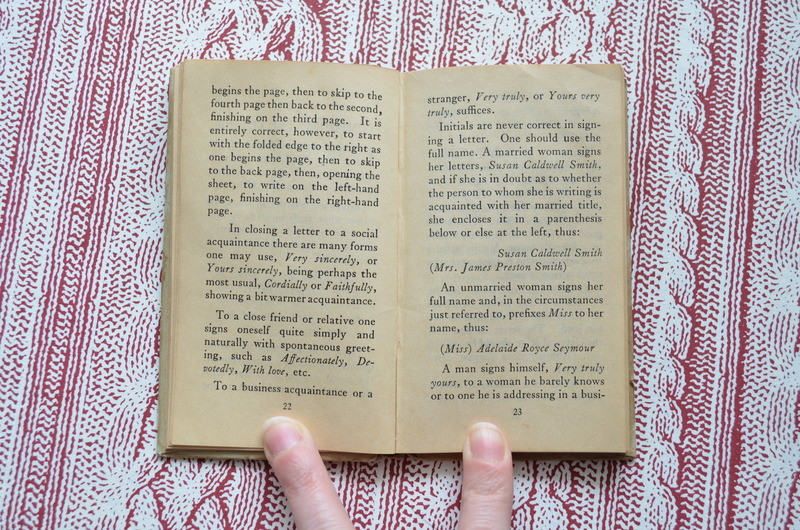 It is a tiny guide that outlines the basic social rules regarding correspondence. 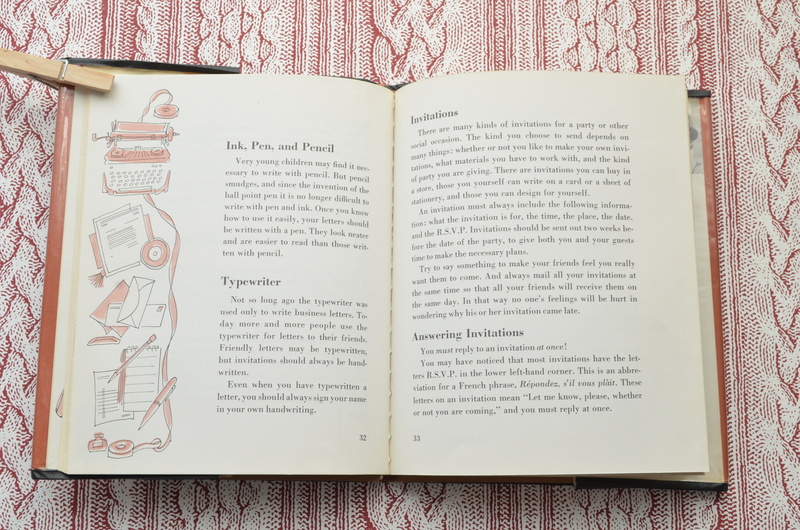 The book comes from a time when married women signed their correspondence Mrs. Husband’s First & Last Name and when wives mailed handwritten invitations to dinner parties and responses came mailed back with handwritten notes. 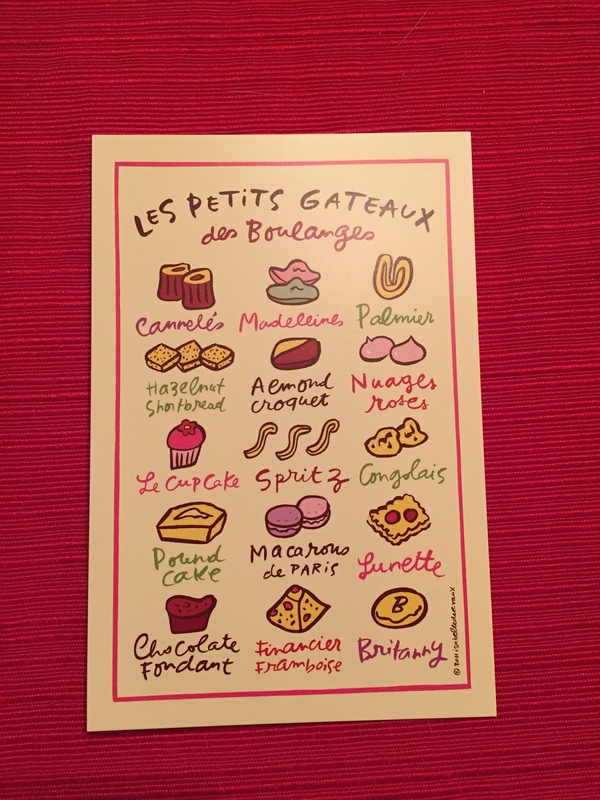 I grew up during a time when party invitations were mailed, but dinner invitations were offered with a phone call. Nowadays, we are lucky if we get a wedding invitation in the mail. Most invitations are offered through emails and texts. (I’m guilty of this too.) Think of the planning it would take to choose a date, write out your invitations, mail them, wait for responses and prepare for your party. You would have to have the proper-sized stationery (blind embossed with your family crest, of course!) 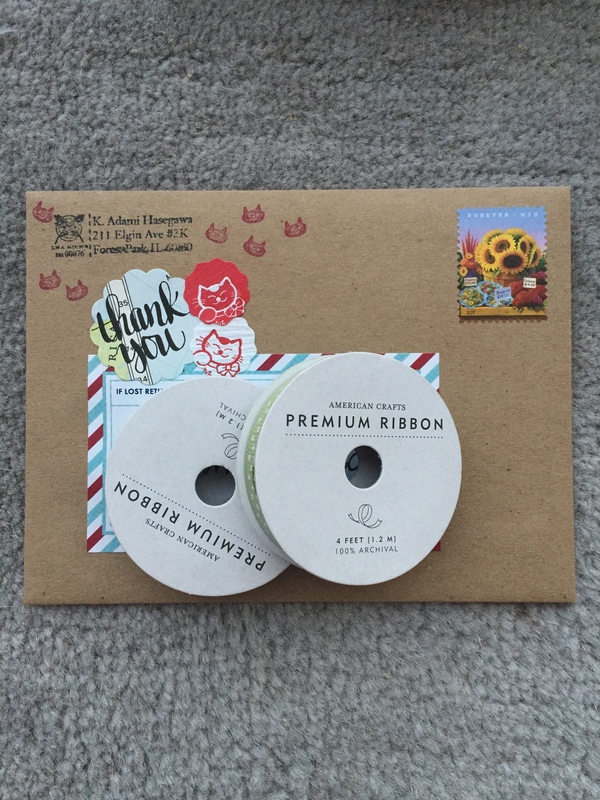 ready to write out and respond to all of your invitations! While I am glad that we have fewer rules dictating our modern day correspondence, I really miss the days of real paper invitations. (I also miss the days of the R.S.V.P. but I can’t even talk about this or I’ll get ranty. This is a funny op-ed about the dying art of R.S.V.P.s.) 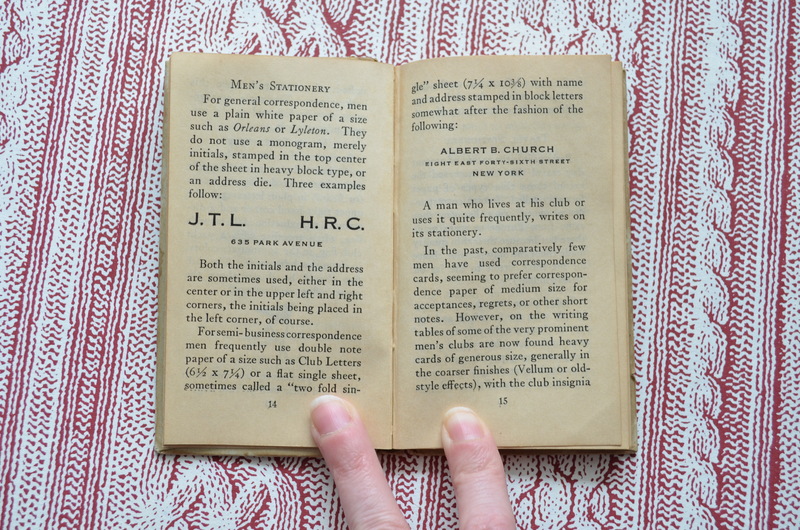 Do you have simple, monogrammed stationery for everyday use (the initials “being placed in the left corner, of course”)? I’ve tried to limit myself when buying frivolous stationery with hopes that I could save up for some stunning engraved notecards. But there are too many good options out there and I like having a variety of paper and notecards to choose from. Still…think of how classy a gorgeously engraved monogram would be. I love the suggestions for closing a letter: Cordially, Faithfully, Affectionately, Devotedly. When did we get stuck writing Sincerely over and over again at the end of our correspondence when there are so many other wonderful options? I enjoy having this little gem on my desk to peruse and daydream about the formal days of visiting cards, handwritten invitation acceptances, summer home stationery, and family crests. Thank you, Peggy, for knowing me so well. P.S. If you’d like to see a few more pages from the book, Donovan wrote a post for the Letter Writers Alliance blog here. How are you feeling about Letter Month?